Current 4105 24-36 Orbit Marine IC LED Aquarium Light with Controller. Ships free to addresses within the lower 48 states only please. SO MUCH MORE THAN LIGHT. The new Orbit Marine IC LED brings your aquarium to life in an entirely new way. Delivering brilliant color and brightness, its capable of things never seen before in an aquarium light. From watching clouds gently roll across your reef to producing surging water currents and pulsing waves, it completely changes your aquarium experience. The key to the Orbit Marine IC LED is LOOP. 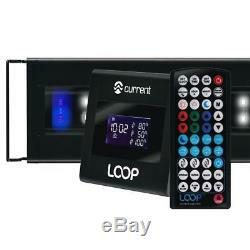 LOOP is the first and only system specifically designed for connecting and syncing lights, pumps and accessories into a single, controllable network. 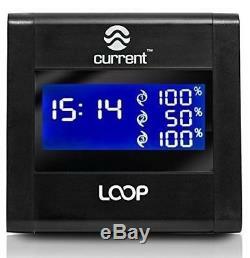 From programming a daily light cycle with weather patterns to creating surging water flow, LOOP simplifies it all. Producing eye-popping color and amazing color rendition, full spectrum control allows you to create the perfect color spectra for your reef. A powerful blend of Dual Actinic blue 445nm/460nm, Dual Daylight white 6,700K/10,000K and RGB LEDs combined with 90° spherical optical lenses delivers the perfect blend of light for strong coral growth and amazing fluorescence. Measuring less than ½ thick, the Orbit Marine IC LED is still the thinnest aquarium light fixture on the market. No loud fans, no distracting knobs, no bulky heat sink. The discreet aluminum profile puts your focus firmly on your aquarium, not the light. Optional adjustable tank mount brackets create an even sleeker look and 90° spherical optical lenses guides light where its need most. A built-in lighting program mimics a 24-hour biorhythmic lighting cycle. The gradual sunrise slowly acclimates your fish and corals to the intense, bright daylight. In the evening, the lights slowly ramp down into a relaxing sunset and soothing moonlight. Industry first IC LEDs produce random clouds and lightning strikes, delivering a more natural, visual effect that can be viewed on-demand or programmed into your daily weather forecast. Once youve installed your Orbit Marine IC LED light and LOOP controller, your set to accessorize and synchronize. LOOP features a built-in wave pump controller, so simply connect a wave pump HUB and add up to 3 eFlux accessory wave pumps to begin making waves. FULL SPECTRUM- Producing eye-popping color and amazing color rendition, full spectrum control allows you to create the perfect color spectra for your reef. NEW TECHNOLOGY- The new Orbit® Marine IC LED brings your aquarium to life in an entirely new way. MULTIPLE MODES- With modes that dim periodically to create cloud cover effects, storm modes that will blow you away complete with lightning strikes and innovative evening modes that include lunar and dusk its sure to add excitement and intrigue to any aquarium. EASY INSTALLATION- Extendable brakets allows this LED light to fit most aquairum fish tanks 18-24 inches wide. REALISTIC EFFECTS- From start-up to sundown, the Orbit® Marine gradually mimics the effect of a slow sunrise, bright daylight, dimming sunset and moonlight. Built-in lighting programs create a 24-hour natural biorhythmic lighting cycle, while on-demand dynamic weather effects gently roll clouds across your reef. The item "Current Model 4105 Orbit Marine IC LED 24-36 Aquarium Light With Controller" is in sale since Thursday, August 9, 2018. This item is in the category "Pet Supplies\Fish & Aquariums\Lighting & Bulbs". The seller is "clamebake99" and is located in Riverview, Florida. This item can be shipped to United States, Canada, United Kingdom, Denmark, Romania, Slovakia, Bulgaria, Czech republic, Finland, Hungary, Latvia, Lithuania, Malta, Estonia, Australia, Greece, Portugal, Cyprus, Slovenia, Japan, China, Sweden, South Korea, Indonesia, Taiwan, South africa, Thailand, Belgium, France, Hong Kong, Ireland, Netherlands, Poland, Spain, Italy, Germany, Austria, Israel, Mexico, New Zealand, Philippines, Singapore, Switzerland, Norway, Saudi arabia, Ukraine, United arab emirates, Qatar, Kuwait, Bahrain, Croatia, Malaysia, Brazil, Chile, Colombia, Costa rica, Dominican republic, Panama, Trinidad and tobago, Guatemala, Honduras, Jamaica.